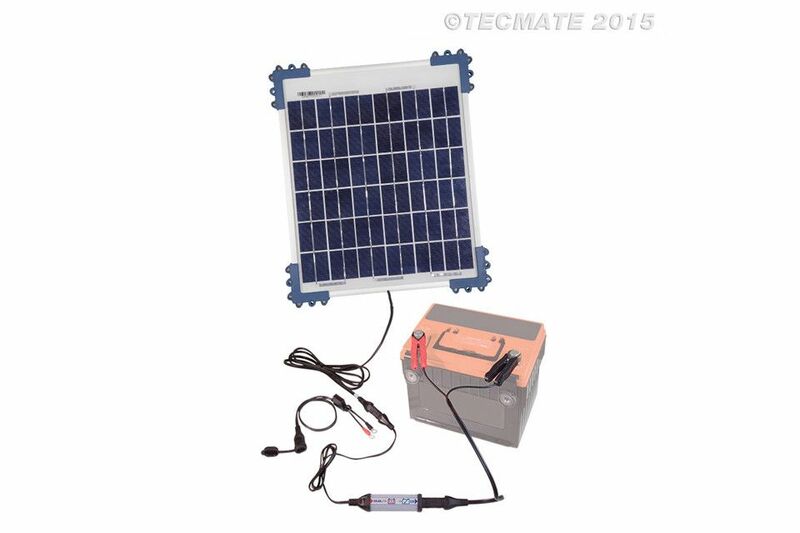 Optimate solar panel impulse charger 10 Watt TM524B, incl. solar panel. An efficient Solar Pulse battery charger and maintainer for when there is no access to an AC or DC supply. The OptiMate Solar comprises of a 12v/10w solar panel and a separate smart controller which makes it easy to see if there is enough solar energy available for operation and whether the battery is being charged or maintained. During use the OptiMate Solar panel converts even low levels of solar energy to pulses of electrical energy which can then be used to charge a battery and as the level of solar energy increases the rate of the energy pulses becomes more rapid as indicated on the smart controller. Once the battery reaches a full charge the pulses will then help to maintain a full charge in the battery for as long as solar energy remains available. The solar panel in the OptiMate Solar is suitable for permanent installation in an outdoor location and we would recommend that it is installed on a sheltered vertical wall, ideally south-facing and with an open view of the sky. We would not recommend installation on a flat or sloping roof. 4-stage charging program for recovery, charging, analysis, testing and maintenance. Suitable for all 12v Wet lead/acid, AGM, Gel and Spiral cell batteries. Suitable to charge a battery from as low as 1v. IP54 rated splash-proof housings for solar panel and charger unit. Solar panel dimensions: 350mm x 500mm x 15mm with 1.8m cable. Smart controller dimensions: 150mm x 30mm x 15mm with 0.8m cable. Solar panel, panel mounting kit, smart controller, crocodile clip set and on-vehicle connector/cable assembly all included.